On average, 6 million people will break a bone each year in the US, and the majority of these bones will heal without complications. For Patrick, his fibula fracture (broken leg) occurred as a result of being struck by a car, and the injury was particularly frustrating because it interrupted the active lifestyle he’s passionate about leading. Patrick came to Ability Rehabilitation to undergo rehabilitation after a broken fibula surgery to regain strength, mobility and confidence in his leg so he could pick up right where he left off before the injury. The fibula, or calf bone, is found on the lateral side of the tibia. It is the smaller of the two bones and plays an important role in stabilizing the ankle and supporting the muscles of the lower leg. Rehabilitation after a broken fibula focuses on restoring stability, flexibility and strength to the leg and ankle. 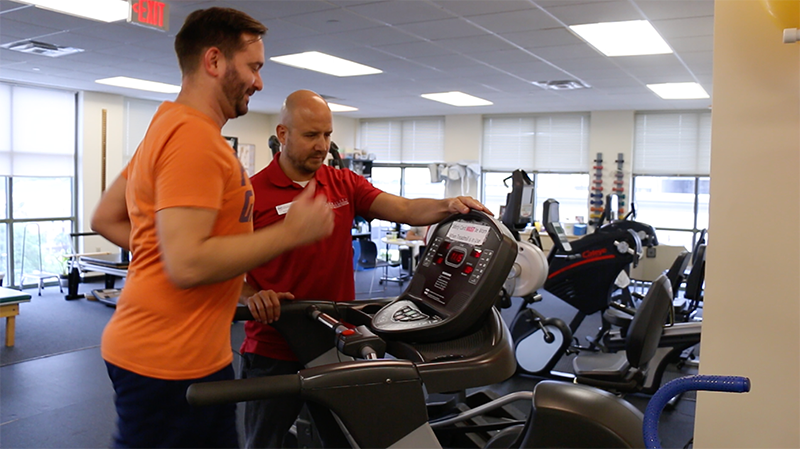 Physical therapy is an important part of any patient’s rehabilitation plan after breaking a bone, but for active people like Patrick who want to return to full form, it is even more crucial. Making sure the bone heals correctly is critical to avoiding re-injury or healing deformities. Walking instruction. Physical therapists can help patients begin putting weight on the injured leg and gradually progress to full weight. Gait training. Physical therapists can give specific instructions and exercises to help restore a normal walking pattern. Swelling reduction. Massaging, compression wraps and ice can all help to reduce swelling and promote healing. Exercise. Exercises to regain the ability to bend the ankle are critical to restoring full walking ability. As strength and flexibility are gained, the physical therapy can provide activity training specific to the patient’s job, leisure activity or sport of choice. Patrick’s main goal was to get back to running as soon as he could. After just four weeks of individualized care and targeted physical therapy, he was able to lace up his shoes once more. Patrick credits the positive attitude and friendliness of the physical therapists at Ability for making his recovery experience a pleasant one. He wholeheartedly recommends Ability Rehabilitation for any patient with any physical therapy, rehabilitation or training needs. As a company owned by therapists, we understand the importance of creating an environment filled with compassion and professionalism to facilitate healing. Our priority is to return each patient to his or her pre-injury level of function. Our therapists have an average of 17 years of well qualified therapy experience.